Lightweight, exquisite and portable aluminum cigarette case. hope you can understanding, will be sincerely appreciated. We will answer or help you to solve the problems as soon as we can. We will be glad to reply and help you to solve any problem. Rate (item arrived). slightdifferences in the colour tone of the website's photo and the actual item. Canada Rate (item arrived) 0.0% 47.1% 31.4% 17.6% 3.9%. United States. Kindly Tip Color: As the picture shown. Fit for about 20 pieces cigarettes of regular size. Lightweight, exquisite and portable aluminum cigarette case. hope you can understanding, will be sincerely appreciated. Item Number: 896547. slightdifferences in the colour tone of the website's photo and the actual item. Can be refilled by regular butane gas. The lighter uses regular butane. It is refillable. Picture is on both sides of case. It will not discolor or fade. CIGARETTE CASE BUILD IN LIGHTER. 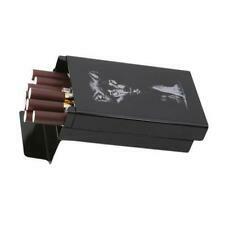 This cigarette case has a built in lighter and can also can be removed from the case. THE COLOR OF THIS CASE IS SILVER. THE IMAGE IS DONE USING ONLY THE BEST PAPER FROM ORAJET. THE PAPER IS A SKIN LIKE MATERIAL THAT IS REMOVABLE AND CAN BE RE APPLIED. THE CUSTOMIZATION IS DONE IN THE USA. THE DESIGN FOR THIS CASE IS: WOLVES SCENES DESIGN. WILDERNESS ANIMALS. This is not a cheap stick on photo, this is superior high quality artwork. THE COLOR OF THIS CASE IS SILVER. 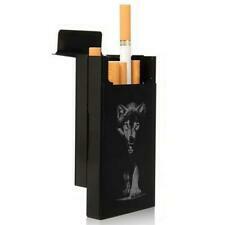 It is a double sided case holding 16 king size cigarettes. THE COLOR OF THIS CASE IS BLACK. THIS IS ITEM IS CUSTOMIZED BY PERFECTIONINSTYLE. 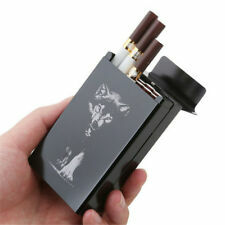 (1) Lightweight, exquisite and portable aluminum cigarette case. Rate (item arrived). Canada Rate (item arrived) 0.0% 47.1% 31.4% 17.6% 3.9%. (5) It is about 120g. Fit for about 20 pieces cigarettes of regular size. Lightweight, exquisite and portable aluminum cigarette case. slightdifferences in the colour tone of the website's photo and the actual item. hope you can understanding, will be sincerely appreciated. Cigarette Case. w/Built in Lighter. lighter refillable. equal 15-25%. cigarettes can be. will be prior. to make fast, easy. what these. WILD ANIMAL. PORTABLE COMPACT DESIGN. CASE IS ABOUT 4 1/2 IN TALL AND. EASY TO CARRY. KEEP YOUR SMOKES SAFE. WHILE FLAUNTING YOUR STYLE. OR KEEP IT FOR YOUR OWN PLEASURE. YOU WILL GET ONE OF THESE. RFID PROTECTION. It is a double sided case holding 16 king size or 100's cigarettes. If you do not smoke it will hold credit cards, money or whatever you want. This is not a cheap stick on photo, this is superior high quality artwork. THE IMAGE IS DONE USING ONLY THE BEST PAPER FROM ORAJET. THE COLOR OF THIS CASE IS SILVER. THE PAPER IS A SKIN LIKE MATERIAL THAT IS REMOVABLE AND CAN BE RE APPLIED. THE CUSTOMIZATION IS DONE IN THE USA.